The Englishman scored a pivotal penalty against Fulham at the weekend. When Alisson and Virgil van Dijk got themselves in an almighty muddle following James Milner's miscued clearance, Liverpool looked set for a 1-1 draw that could've proved to be a detrimental blow to their title hopes. However, Sadio Mane was to be brought down inside the box to gift Jurgen Klopp's side a chance to take all the spoils on an afternoon where they were well below their best. 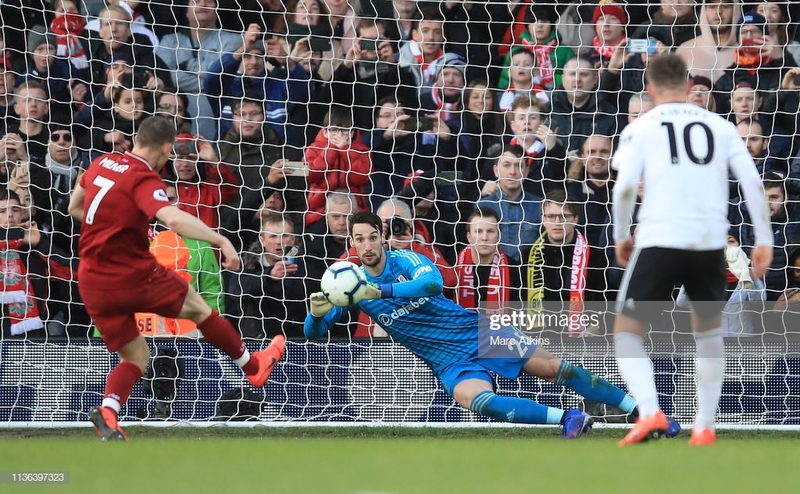 James Milner has proved to be one of the most reliable figures from spot kicks within England's top-flight and he looked unfazed once again, stepping up for what could end up being a crucial goal come the end of the season with an ice-cool finish. The win saw Liverpool return to the top of the Premier League, two points ahead of Manchester City who have a game in on their title-rivals having featured in the FA Cup over the weekend. The Reds will play another game in hand on Pep Guardiola's side when they face Southampton after the international break , putting pressure on City to do their job for the remainder of the season. “It was me who put him [Van Dijk] in the mire,” Milner told Sky Sports post-match. The gaffer said ‘come on and calm it down’, so the best thing to do is to slice it over the top and put Virgil under pressure, which wasn’t ideal! But luckily enough we got the result and did what we needed to do." Liverpool face Spurs after the international break before pivotal clashes against Chelsea and a Champions League tie with Porto.